These are professional quality Mixing Whips & Paddles! Made from high quality hardwood and food service grade stainless steel! These mixing paddles and Whips are preferred by more Chefs! 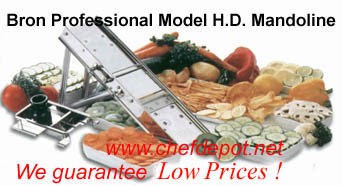 Chef Depot supplies Great Cooks! This is a professional quality 24 inch Heavy Duty 18-8 Stainless Steel Mixing Paddle! Ideal for mixing large batches of food. Food service grade solid stainless steel, it will not break or bend. These mixing paddles are preferred by more Chefs! More Stainless Steel Paddles are available, click the right green arrow on the bottom of the page. High quality 40 in. Stainless Steel Whip! This is the professionals choice! This style is perfect for large stock pots and medium steam kettles. Fully sealed handles. These mixing whips are preferred by more Chefs! Click Here for standard size whips! Click Here for Small Mixing Spoons, Whips & Paddles! High quality 48 in. Stainless Steel Whip features a 8 in. diamater ball head! This style is perfect for very large stock pots and large steam kettles. This is the professionals choice! These mixing whips are preferred by more Chefs! 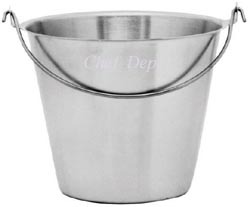 Chef Notes: Great for bar ice buckets! Perfect for bakeries to cool off toppings and pouring icings too. I likes these buckets, made to last. He uses them at every one of his restaurants. Perfect for milk, honey or maple syrup too. This stiff wisk is the professional choice for soups and sauces and whipping thicker foods. Excellent for small batches of homemade mashed potatoes. It is 12 inches long and made from solid stainless steel. We only sell the best quality, this whip will last through years of daily use! Chef Notes: This is the perfect whip for stirring thick soups, sauces and whipping up a batch of mashed potatoes. Click Here for Colored High Heat Spatulas! This is a professional quality 48 inch Heavy Duty 18-8 Stainless Steel Mixing Paddle! Ideal for mixing lage batches of food. Food service grade solid stainless steel, it will not break or bend. These mixing paddles are preferred by more Chefs! Click Here for Chef Knives and Cutlery Kits & Cooks Sets! 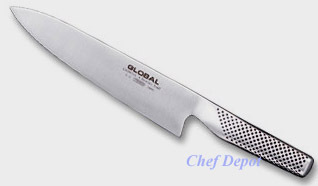 This is the new 7 inch blade Global Chef Knife, the most used knife, it easily glide through food! Each handmade knife is forged from super high quality Japanese alloy steel. It is very sharp. Lifetime Warranty. Chefs Note: Sweet Chef Knife, cool handle, razor sharp, super thin edge, perfectly balanced and amazing CROMOVA steel blade. If you want a high quality knife to pass through generations, you found it. Bonus: Free Offers too, click on the link Below! 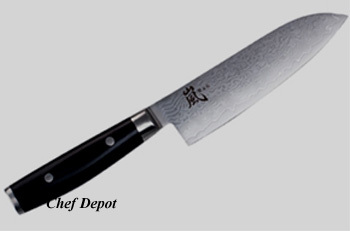 Chef Notes: We like the feel of this beauty and the extra sharp thin blade. Global knives are made from the finest high carbon stainless steel available for producing professional quality kitchen knives. Yoshikin uses its own proprietary stainless steel which it calls CROMOVA 18 Stainless Steel. This steel is hard enough for Global knives to keep their edge for a long time, but soft enough so that it is not too difficult to sharpen the knives. The CRO in CROMOVA 18 stands for chromium and the 18 is the percentage of chromium in the steel. This high percentage of chromium contributes to Global's good stain resistance. The MO and VA in CROMOVA 18 stand for molybdenum and vanadium. These two elements give a knife good edge retention. See FREE OFFERS above & below! More GLOBAL Knives, on sale now! Click Here! Swiss Diamond Chef Pan has 200,000 diamonds on sale now! Click Here! This is a handmade high quality 31 inch Wooden Mixing Spoon! Made from high quality beechwood! The head of the spoon is large. Perfect for the stockpot, serving up the grub or display. We know a few kids who could use one of these upon the backside. A great gift idea for teachers! These spoons are preferred by more Chefs! Click Here for Small Whips! A Chef is reviewing our USA made high heat spatulas. These feature solid rock maple handles and the pure food grade silicone top is removable (you have to pull hard). Chef is using one of his favorite NSF Maple Cutting Boards. Custom logo handle branding is available for large quantities. These are made in USA! This is a new Santoku Knife, with 6.5 in. blade, Handmade in Seki City Japan. The VG10 High Carbon 69 layered steel Damascus blade is one of the sharpest and strongest blade made. Crafted by hand in Japan. The unbreakable poly linen micarta handle features 2 perfect rivets. The edge that is holds is hair splitting and remains throughout heavy use. Ideal 60 - 63 Rockwell hardness. Many Handmade Japanese knives are available at low prices, please email us for more info. Click Here for Japanese knives! Click Here - Designer Colored Chef Tables! Click Here - Chefs Chopping Blocks! Click Here for more hand held mixers! In stock, for fast shipping! Click here for more mandolines! Video demo's are here! This is a professional quality 24 inch Wooden Mixing paddle! Made from high quality hardwood! These mixing paddles are preferred by more Chefs! This is a professional quality 30 inch Wooden Mixing paddle! Made from high quality hardwood! These mixing paddles are preferred by more Chefs! This is a professional quality 36 inch Wooden Mixing paddle! Made from high quality hardwood! These mixing paddles are preferred by more Chefs! The new MiniPro is perfect for shakes and smoothies, pureeing small soups, sauces, fruit coulis, meringues, whipped creams specialty desserts and more! A truly professional mixer for small preparations! Light and user friendly (990 gr. ), quick and efficient (13.000 R.P.M. ), equipped with a special 4-blade knife set, robust (dual cooling turbine), easily detachable shaft, practical (flexible cable), graduated bowl 1 L.
Chefs Note: We have all used Robot Coupes in the past. This unit is not only easier to use and faster, it is dishwasher safe and stronger than the competition. The mixers meet all NSF standards for safety and sanitation. We have the best prices! Click Here for more Hand Immersion Blenders! Click Here for Colored High Heat Whips & Rubber Spatulas! This is a professional quality 42 inch Wooden Mixing paddle! Made from high quality hardwood! These mixing paddles are preferred by more Chefs! This is a professional quality 48 inch Wooden Mixing paddle! Made from high quality hardwood! These mixing paddles are preferred by more Chefs! Click the page links below and green arrow on the right for more Mixing Paddles!